Water! The lifting of water was the first preoccupation of early humans as they entered the era of systematic agriculture. 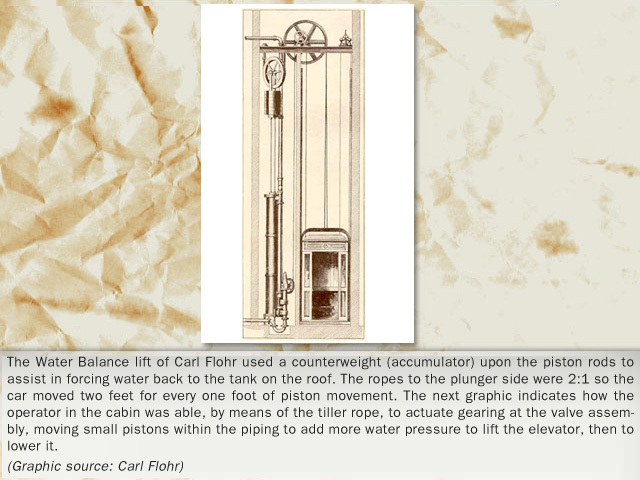 In turn, water later became the primary medium of lifting for two centuries. 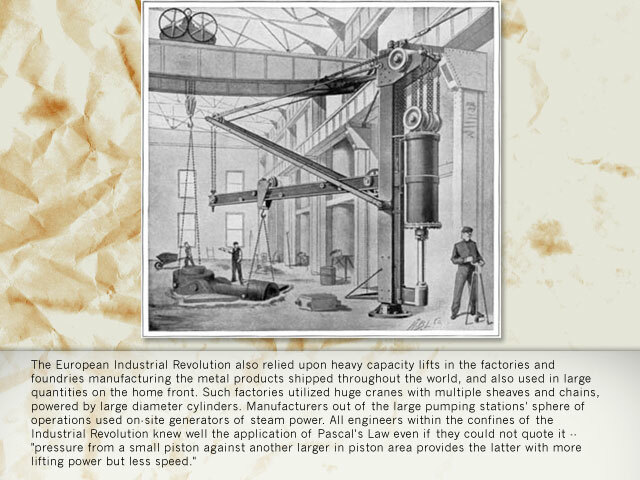 It was a tremendous servant when converted to steam at the outset of the European Industrial Revolution -- one of the igniting sparks! 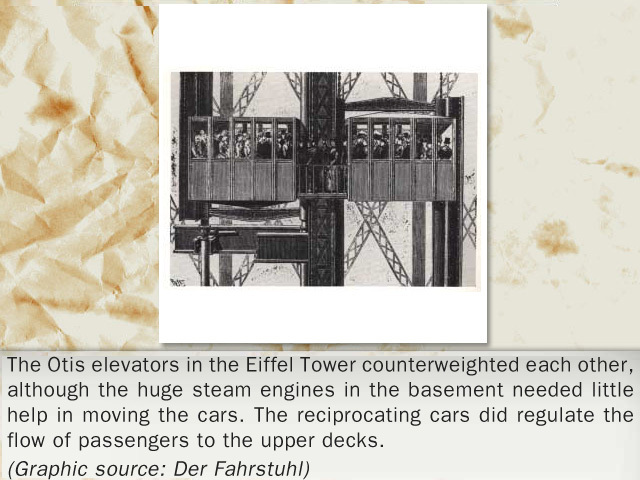 For a brief period, it was used as a counterbalance; then, backed by central or on-site steam or gas engines, it was the medium that pushed and pulled -- either through roping or direct-action -- lifting very heavy loads and moving passengers to new heights at previously unobtainable speeds. 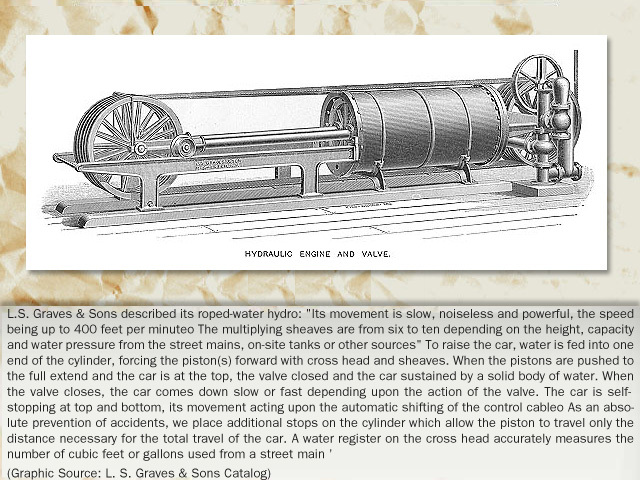 Water was easily manipulated by primitive, then increasingly sophisticated valve systems. 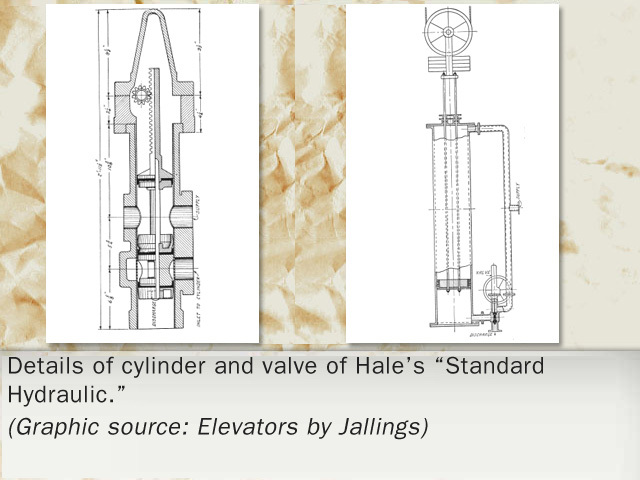 In this era, the sinking of holes for cylinders became a new art form, and the elevator industry learned to use accumulators and counterweights with increasing expertise. 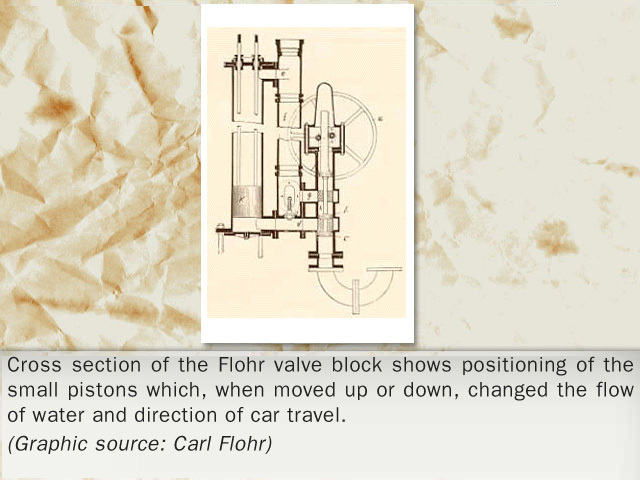 The need for piston and valve packing engendered new materials and techniques. New alloys and finer finishes were developed for cylinders, pistons and valve blocks to take higher pressures and provide smoother operation. 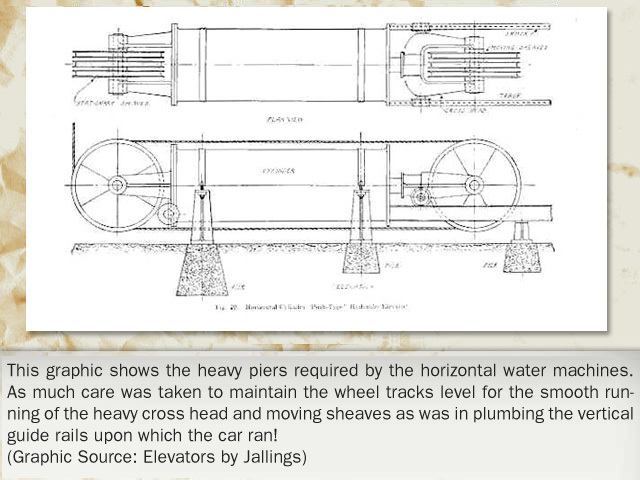 The water hydraulic era began with slow, heavy industrial lifting at the docks, foundries and factories; migrated to low-level commercial lifting, then moved on to high-speed passenger applications with either direct action or the multiplication of sheaving. 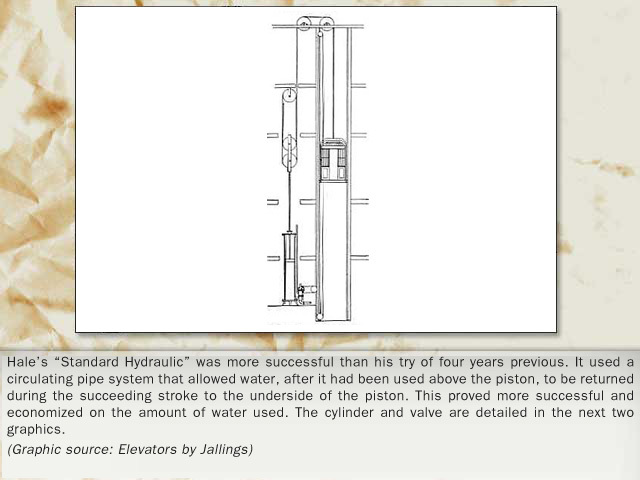 On the way, the enormous lifting capacities of water hydraulics was tapped to lift, often with equalization, rail equipment, stage lifts and other enormous loads once thought unmanageable. 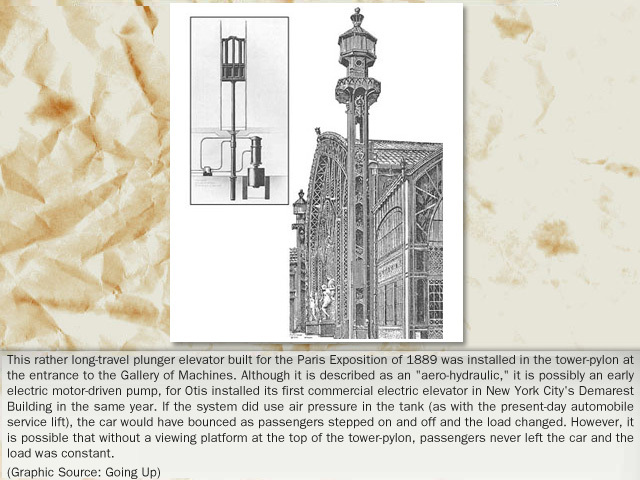 So efficient were the hydraulic elevators they were to reappear during the electric era, in a new dimension and renewal of their former glory, powered by oil instead of water! 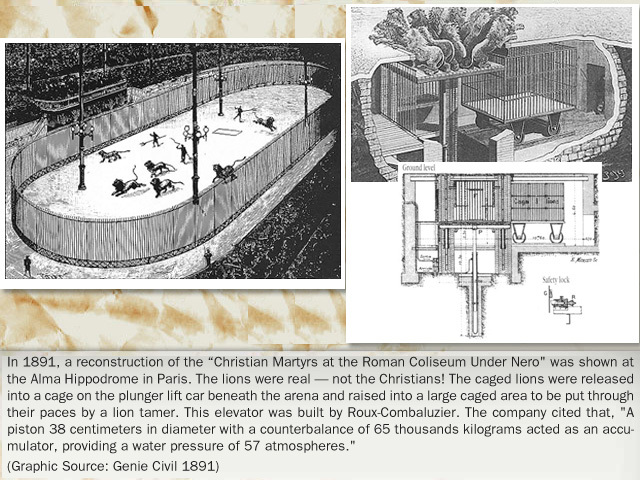 Elevating materials throughout early history was deemed more important than lifting people, although isolated attempts were made to elevate Royalty and Princes of the Church within their domiciles. 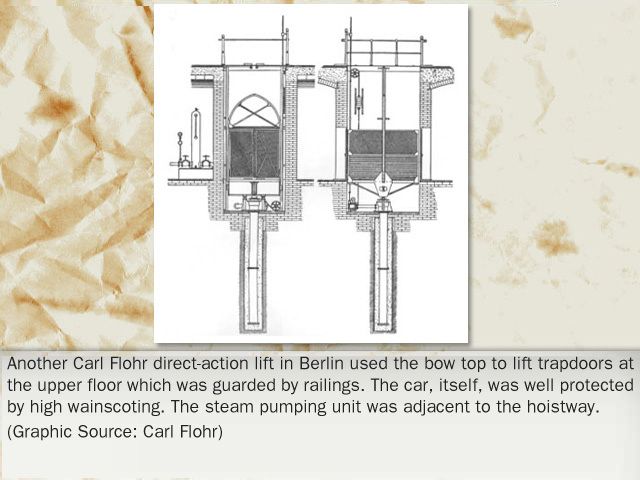 Loads of materials in most instances were much heavier than a cabin of passengers, prompting much thought to lifting cargo by hydraulic power, a form that could be multiplied in a variety of ways. 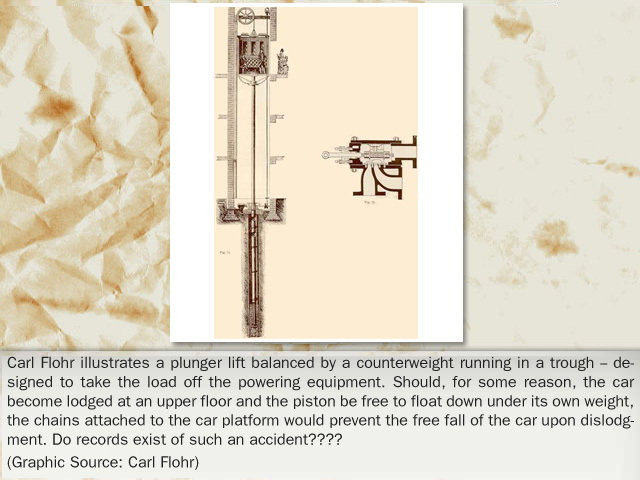 The idea for lifting loads by hydraulics was envisioned by Yorkshireman Joseph Bramah who received a patent in 1795 for the principle of a hydraulic press. 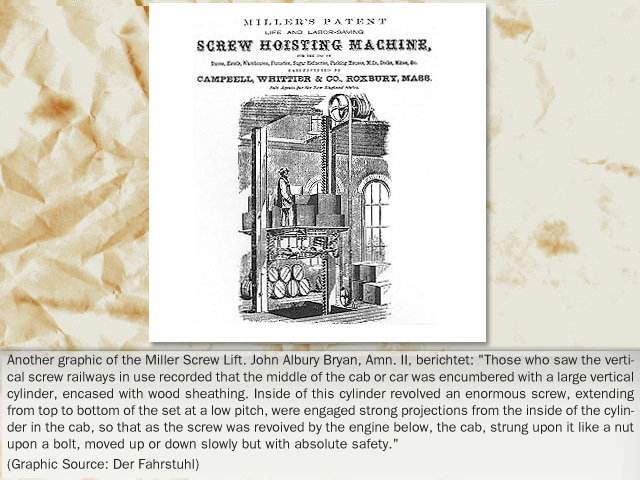 He is better known for his experimentation and patenting of the all-important leather cup that would contain the water under pressure within a cylinder, yet allow the easy movement of the piston. 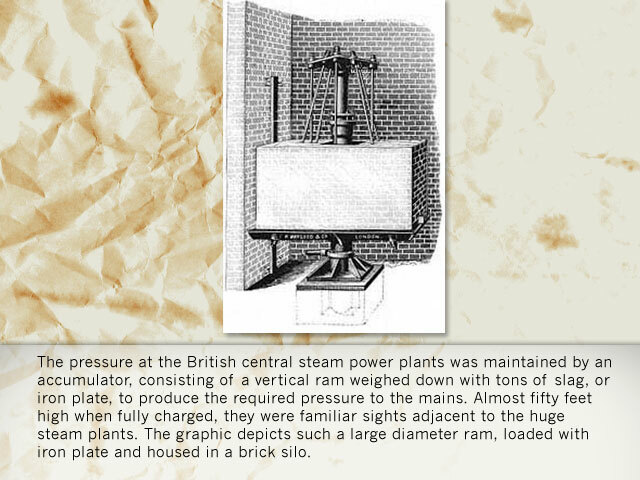 He foresaw high pressure mains in English towns in one of his last patents in 1812 but half a century had to pass before practical application. 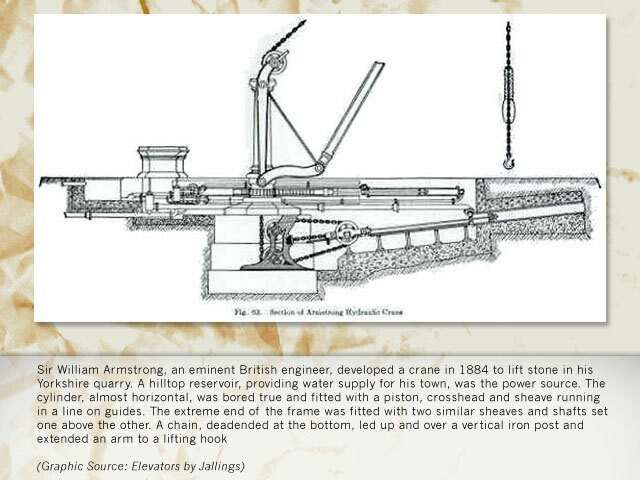 That practical usage was the brain child of Sir William Armstrong in 1848. 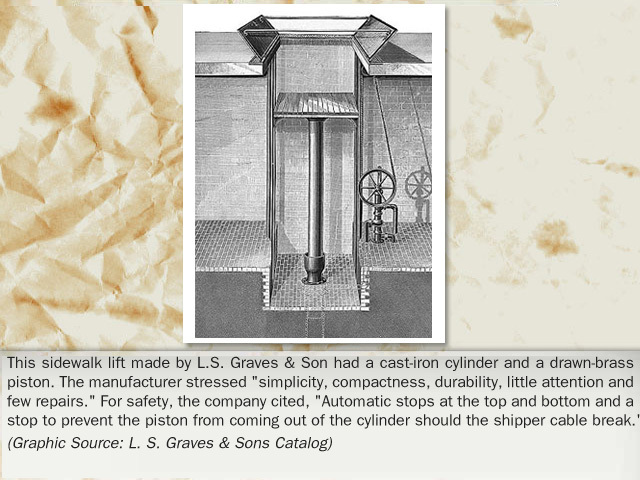 Low pressure lifting machines were developed thereafter with large diameter cylinders. 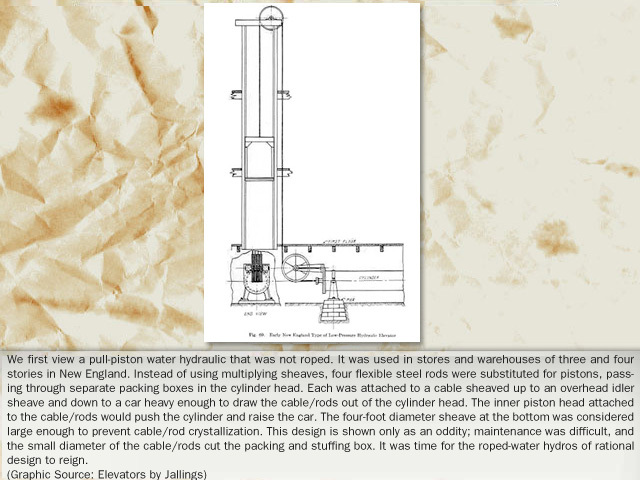 To power the industrial lifts to load the vessels of "Her Majesty's Fleet," British engineers came to use a source older than England, herself -- the water of the River Thames. 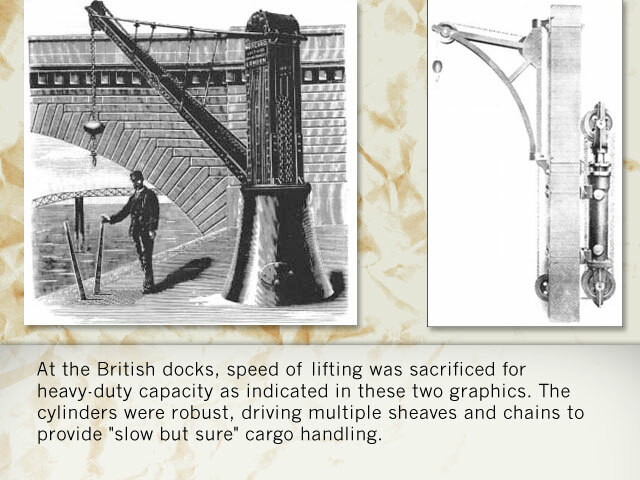 Few activities were more important than keeping commerce moving through the docks of London, then the world's largest city. 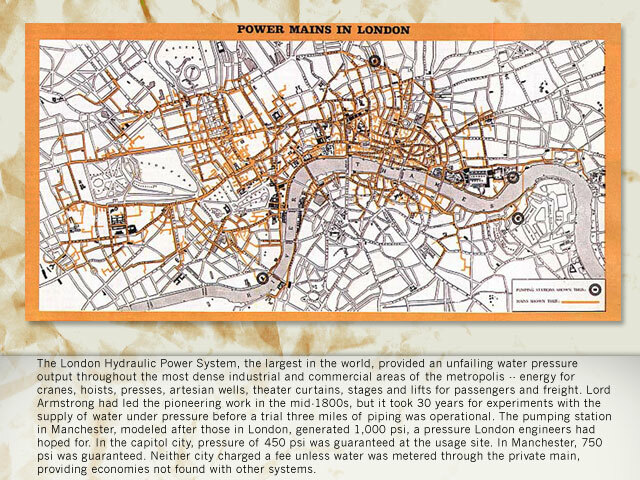 In 1871, Parliament gave monopolistic powers to the Wharves and Warehouses Steam Power and Hydraulic Pressure Company, and by 1883, it laid seven miles of mains on either side of the river with 700 pounds per square foot being generated at the Falcon Wharf Pumping station. Intensifiers and accumulators augmented chains, ropes and sheaves to increase industrial capacity of hydraulic power. 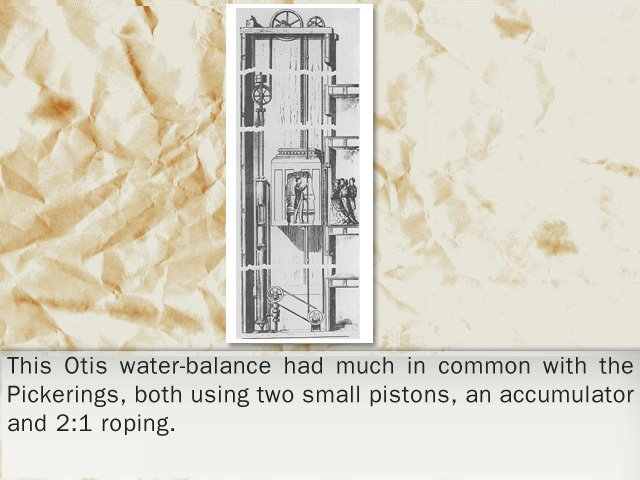 As seen with the early Egyptian shaduf, counterbalancing was a natural means of taking the strain off man's muscles in lifting water from the Nile. 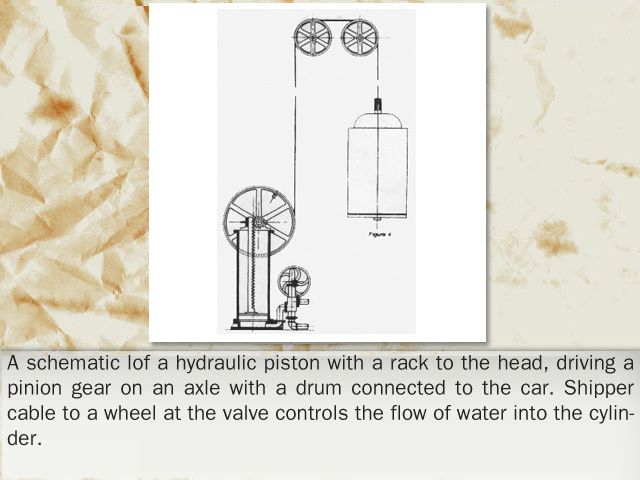 First came a force of nature -- the counterbalancing use of water, using gravity to bring the fluid back to the hydraulic cylinders. 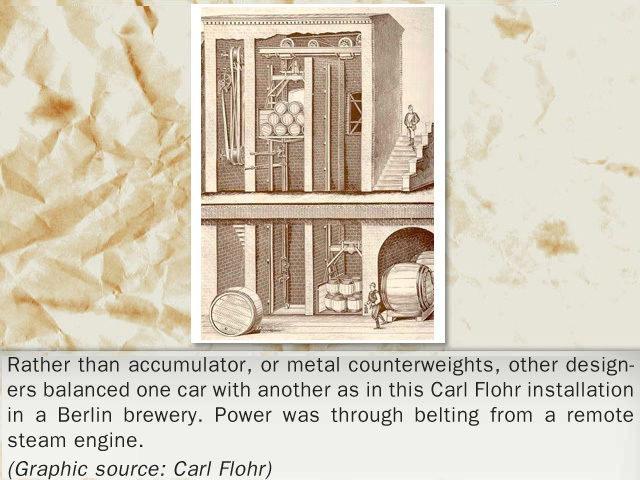 Then, accumulators were used as an equalizing force. 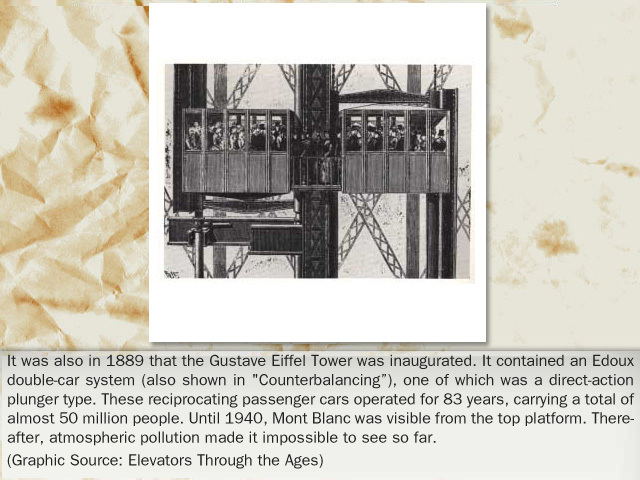 Cars balanced one another and the counterweight in its own runway became a norm that carried through the electric era. 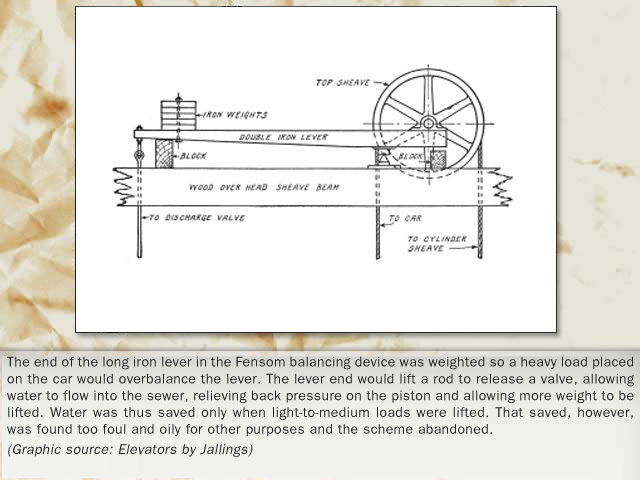 Counterweighting was seen as a resource when steam, hydraulic or electric power was considered insufficient to alone accomplish the task at hand. 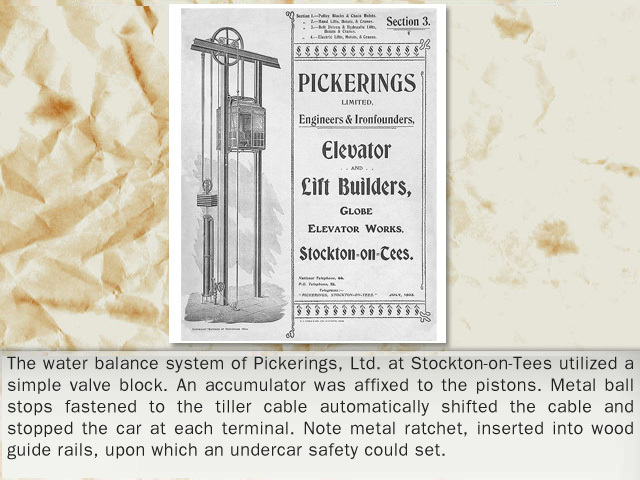 Although the art of counterbalancing might well take the strain off the power unit, the additional weight on both sides of the cables, chains or ropes placed additional pressure upon these devices as well as overhead and machine sheaves, and the structural supports for the entire system. 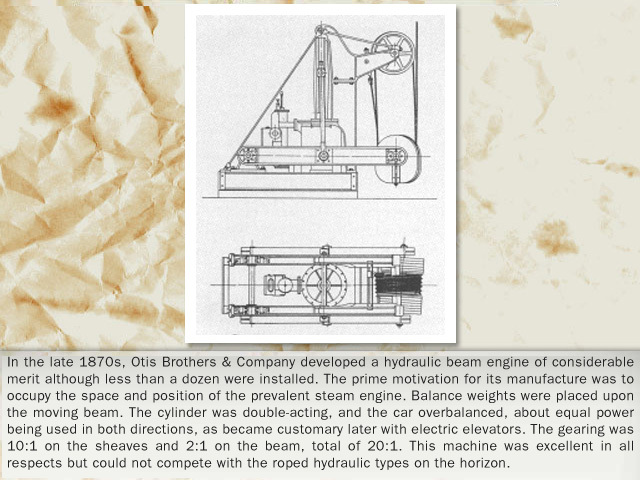 Heavy lifting at the docks, and in the factories, with water hydraulic pressure was augmented by direct-action lighter capacity lifting in commercial establishments. 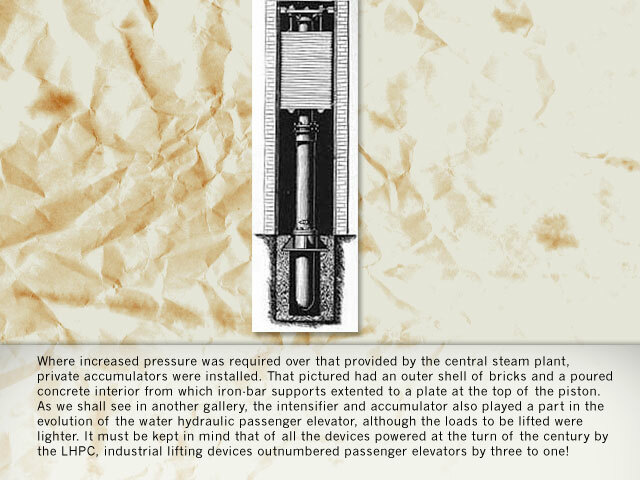 Unroped plungers were practical for short travel that most often occurred in service between the basement and street level. 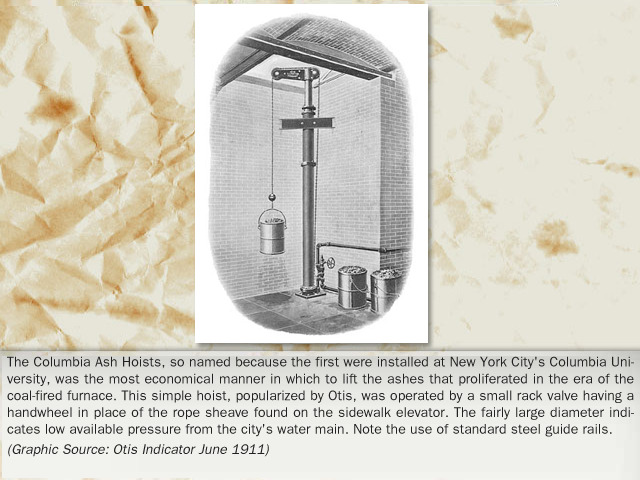 The most basic direct-action piston lifted a lowly ash can, important in the era of coal burning furnaces for heat. 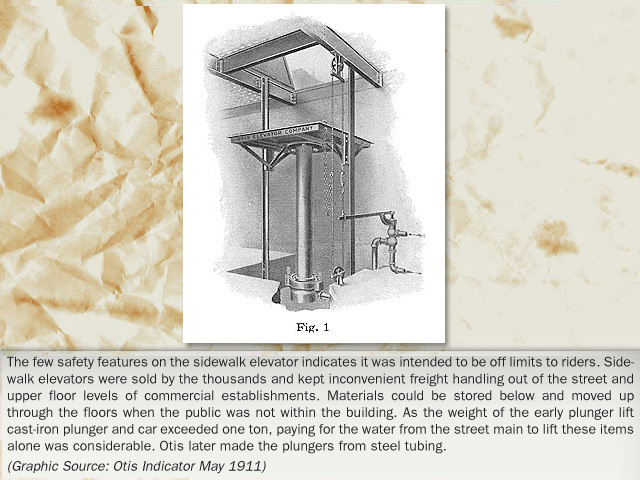 The "sidewalk" plunger elevator took freight from the truck to basement storage and at first had little protection as the deliveryman loaded freight onto the platform and the store employee unloaded at the lower level. 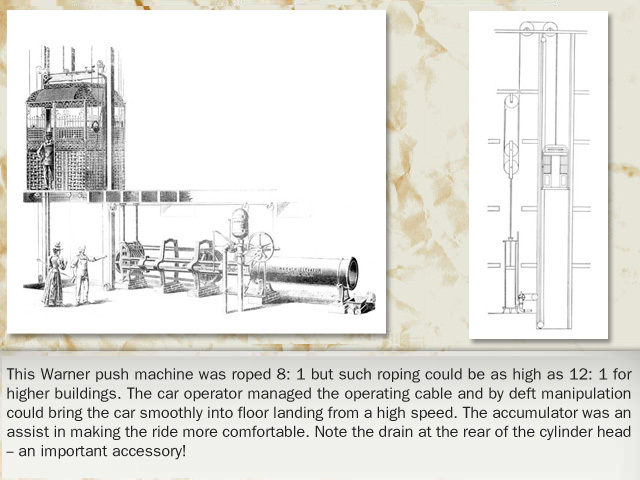 Control as simple a valve was utilized, at first operated with a lever, then a wheel and cable. Riders were discouraged. Later, the bow crosshead lifted the bi-parting, flip-up doors at the sidewalk to each side automatically as it rose. 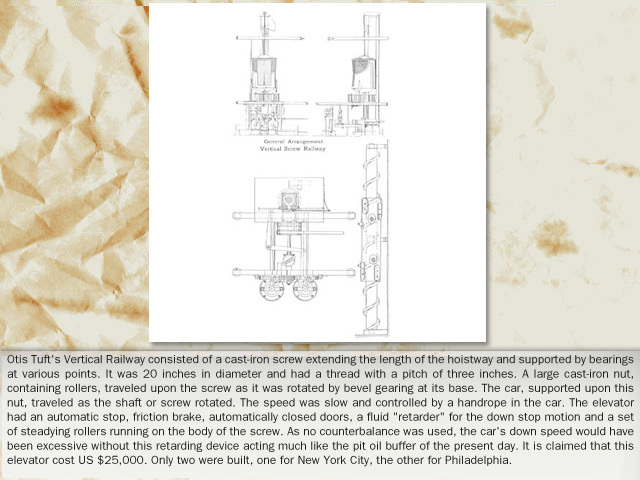 A car designed to rise above the street level to truck bed level obviously was a next step in the reduction of labor. 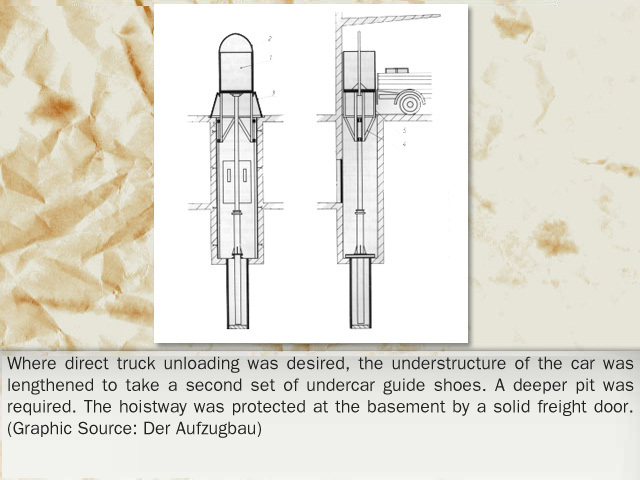 Such a car necessarily had an extended understructure with guide shoes that allowed the extended travel. It also required a deeper pit. 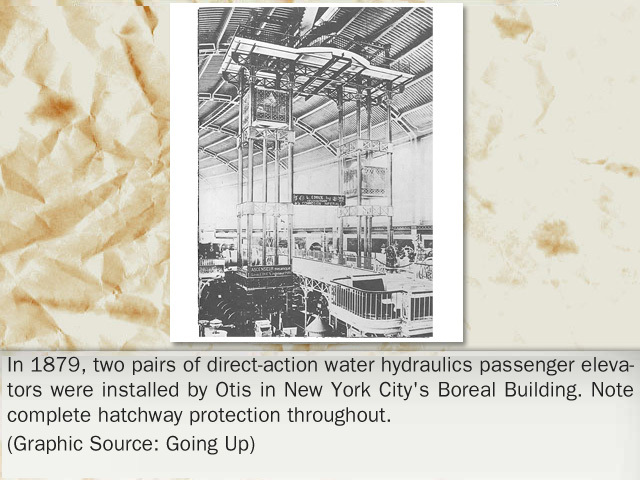 Eventually the direct-action hydraulic proved its worth inside commercial buildings. 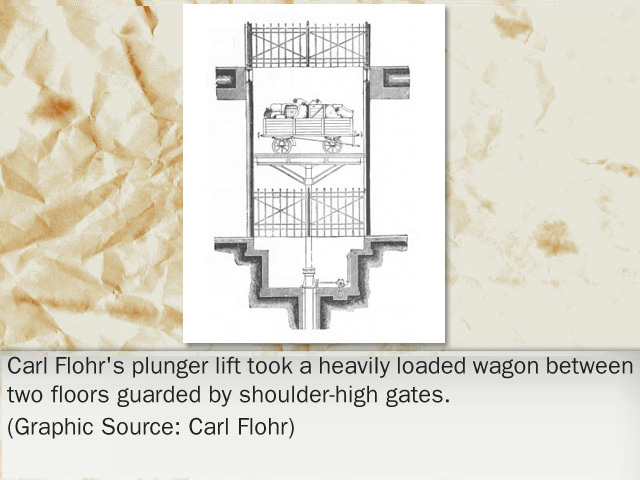 As personnel were more apt to ride such lifts, along with the cargo, safety railings, then gates, became important fixtures. 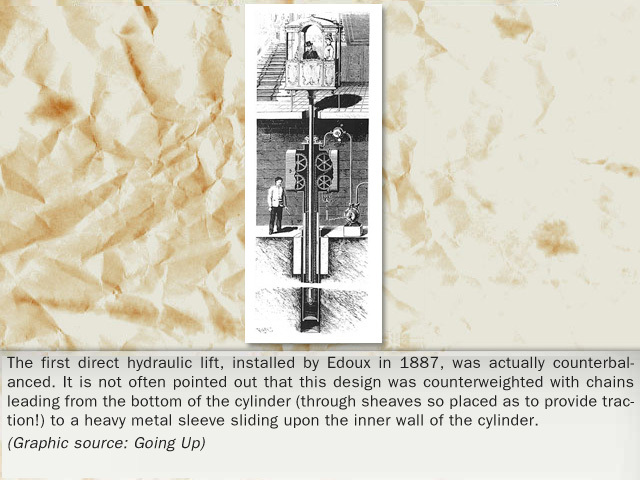 The element of surprise, seen as important in the entertainment of earlier civilizations, was no less important as generations passed and the direct-action hydro played an important role in stage lifts — as they do to the present day. 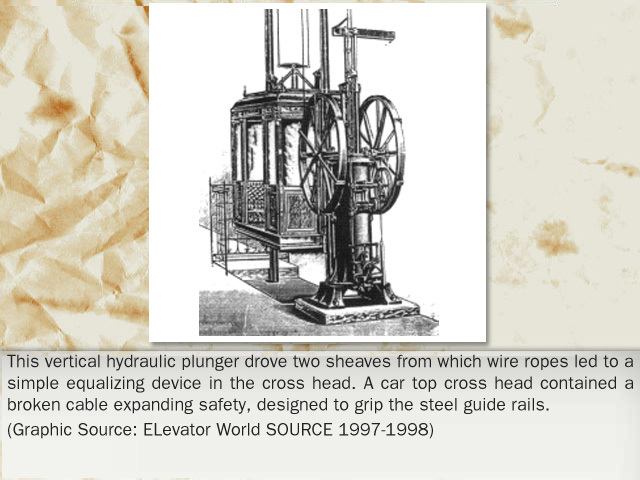 Just as oil-hydraulic power was first popularized for industrial use in the 20th century, so the water hydraulic was used to its greatest advantage for low-travel, heavy lifting. 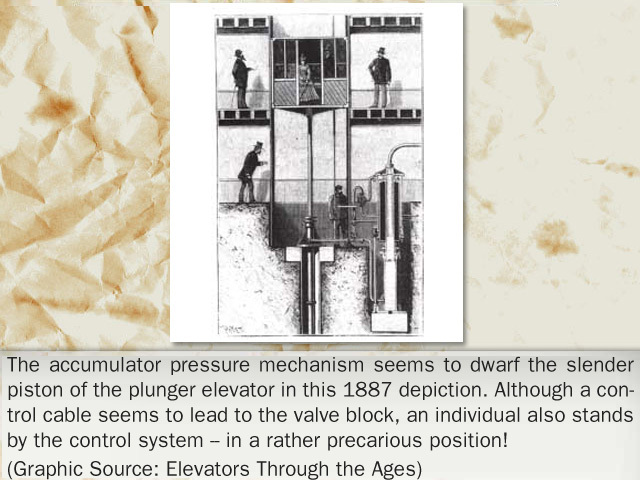 Plunger passenger elevators came into being, but it was expensive to sink the jack holes the number of feet the owner wanted to elevate his customers within the building. The speed was also limited, the control of acceleration and deceleration difficult and the ride increasingly rough as higher speeds were attempted. 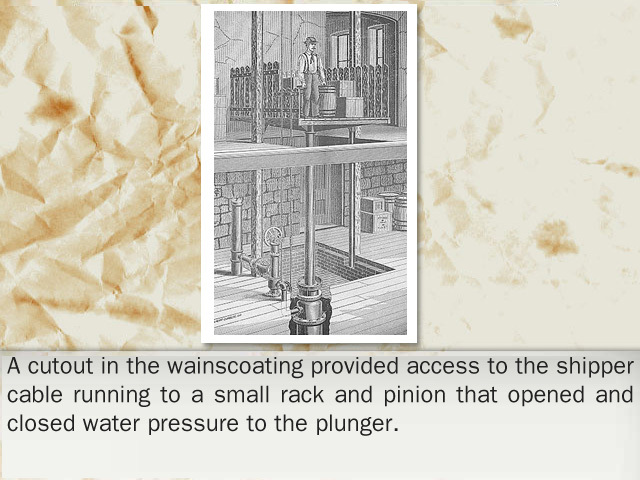 Yet engineers kept busy attacking the challenges of the plunger passenger. 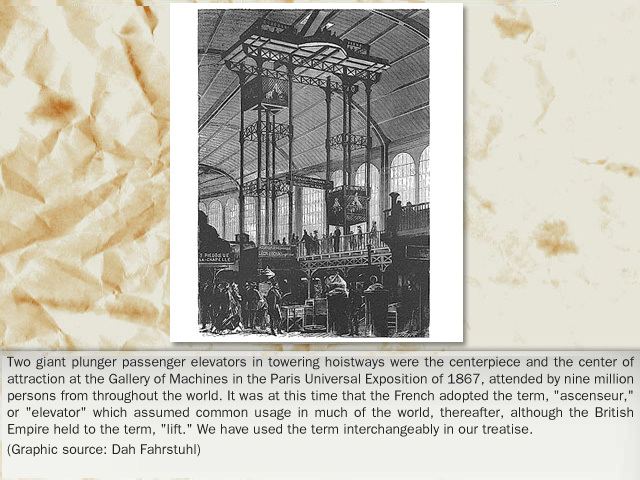 Leon Edoux, in addition to being a renown civil and hydraulic engineer, was a showman par excellence as indicated by his presentation of giant direct-action passenger hydros at the 1867 Paris Exposition. 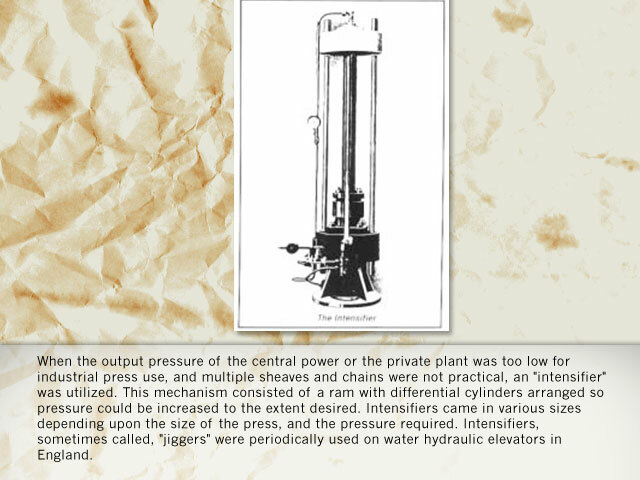 We see application no higher than four floors in Europe although plungers were sunk for greater depths in the cities of the U.S. Eastern Seaboard as hole drilling had become an American science. 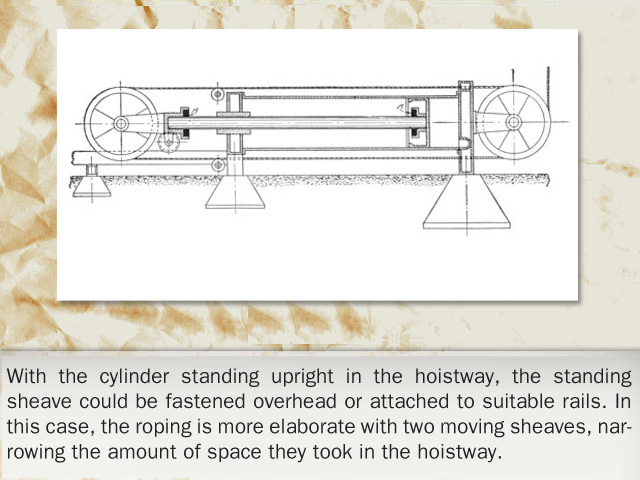 The scene was set, however, for the emergence of the roped hydraulic design which was to hold sway for half a century. 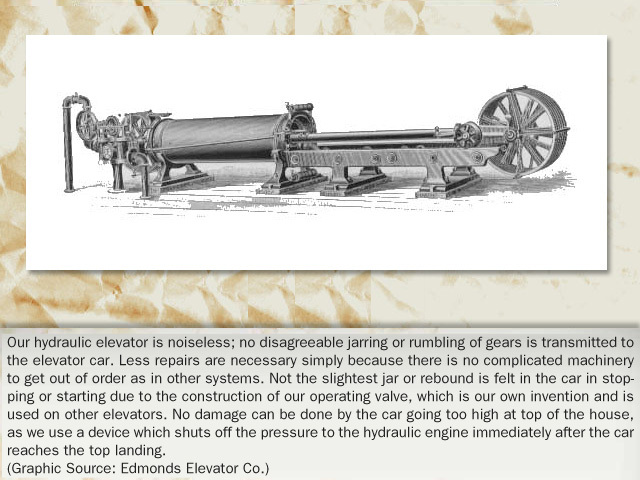 As the elevator industry sought to develop safe and efficient roped- and direct-action hydraulic elevators, hydraulic and mechanical engineers were experimenting with various other methods of utilizing steam/plunger power through gearing. 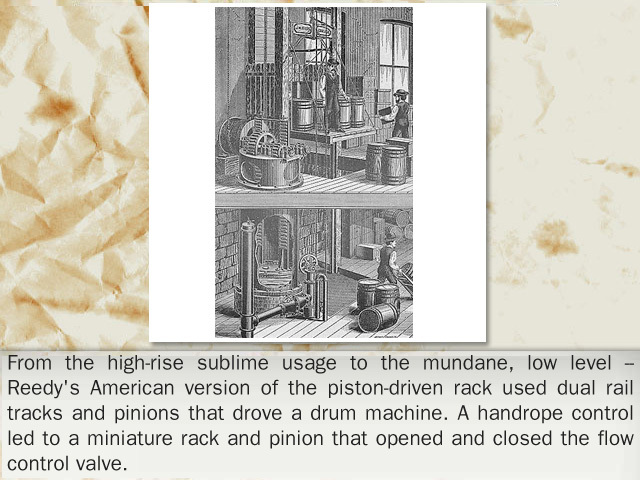 Most designs involved gearing attached to pistons driving winding drums. 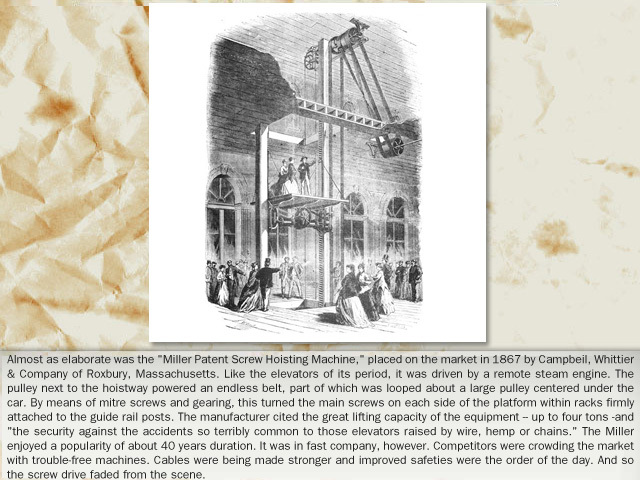 The most elaborate combination was the "Vertical Screw Railway," so named by a prolific inventor of the period, Otis Tufts of Boston. 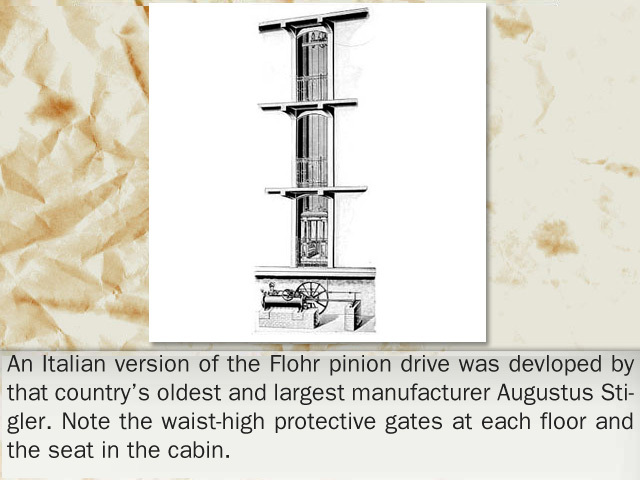 His spiral screw lift was installed at New York City's Fifth Avenue in 1861. 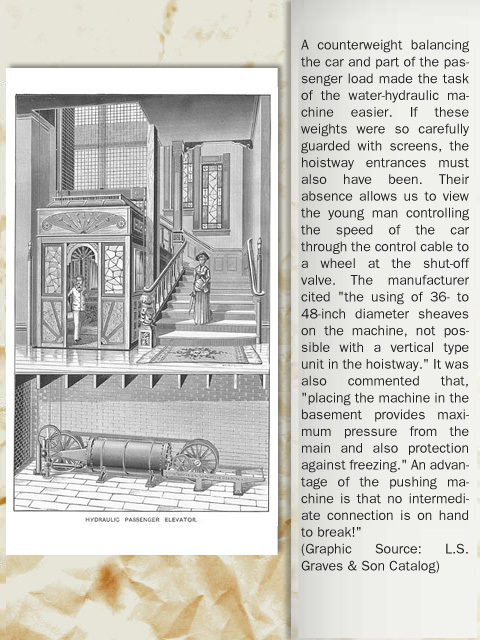 Various kinds of counterweight -- water and otherwise -- were attempted but found to be bulky and expensive. 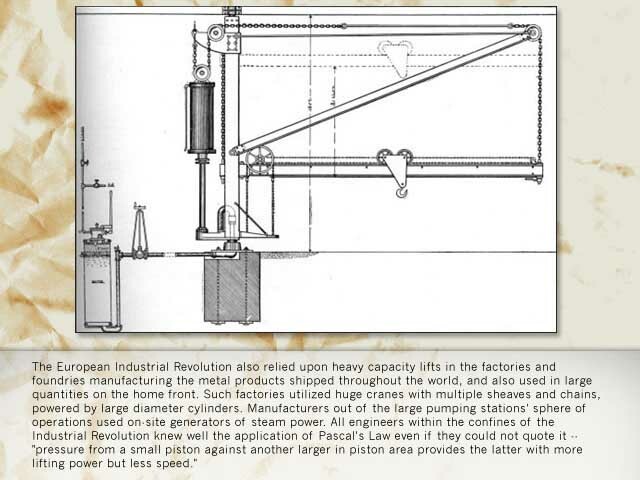 Required was a relatively simple design that would multiply the force of the plunger and steam power. The single sheave exited quickly and the double sheave with one at the cylinder and the other being pushed came into vogue. 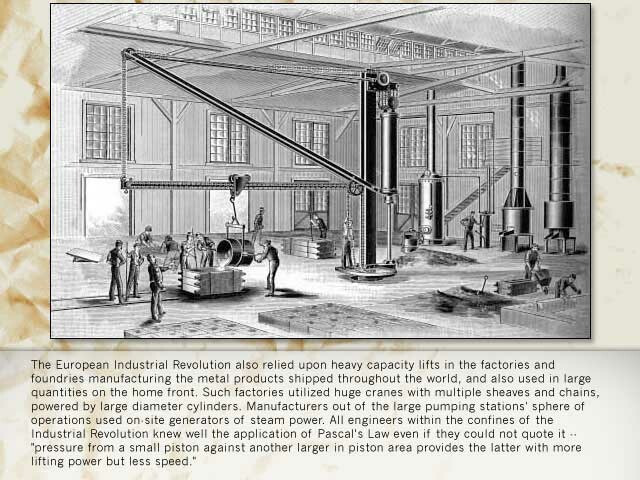 These occupied a reasonable amount of space and were provided with one or two pistons. 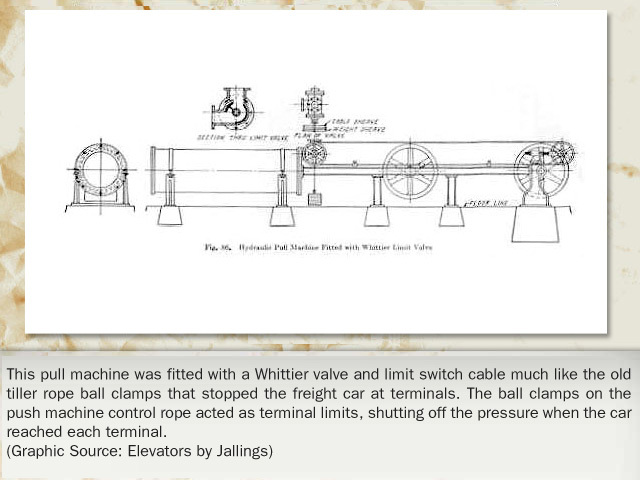 Within a short time, valve functions were refined, operated from the car's tiller cable and allowing the operator to change direction of travel. 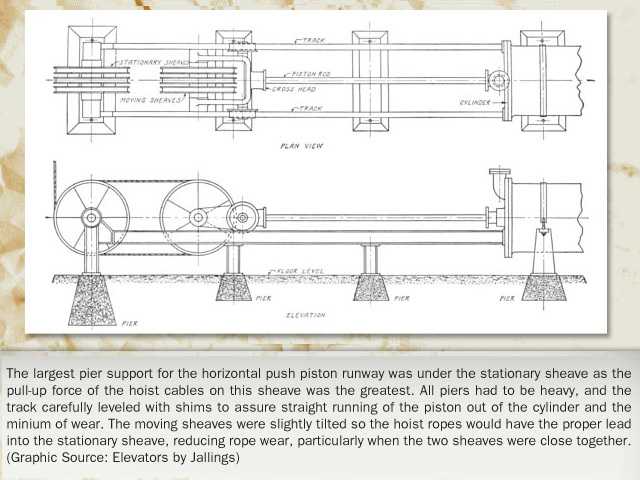 Limit switches at either end of the piston runway were arranged to shut off the water at the extent of the run. 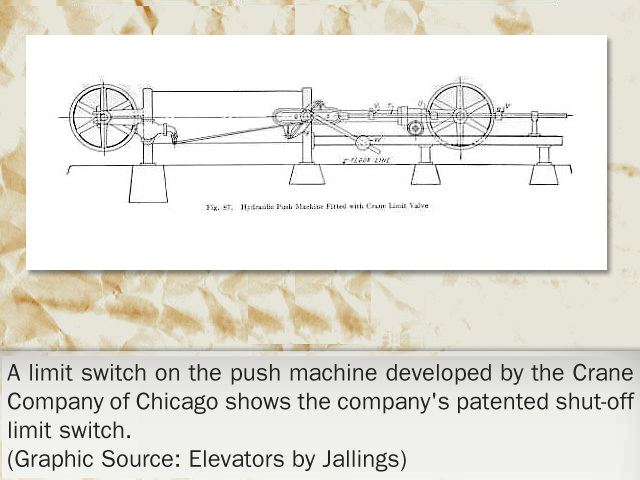 The pull type roped water hydraulic proved its worth for the moderate speed passenger elevators so many of which were being required by the spread of multi-level commercial buildings. 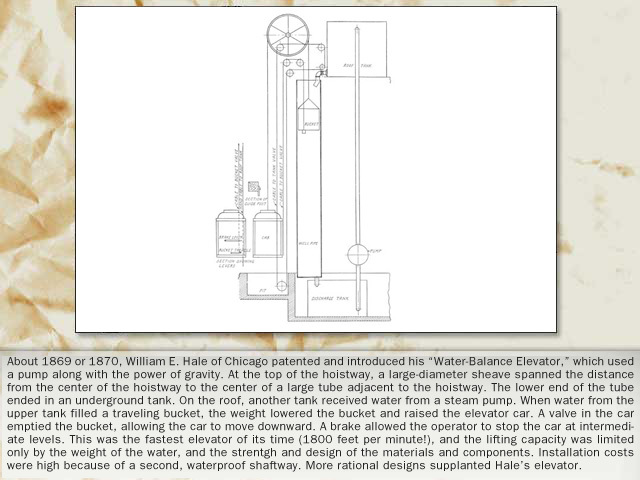 In the early days of the hydraulic elevator era very low water pressures were typical, sometimes as little as 25 to 30 pounds per square inch.With gravity tanks on six or seven story roofs - about the limit to which most American cities could lift water - large diameter cylinders and piping were necessary to keep hydraulic losses small. Slow car speeds and poor efficiency were the consequence. 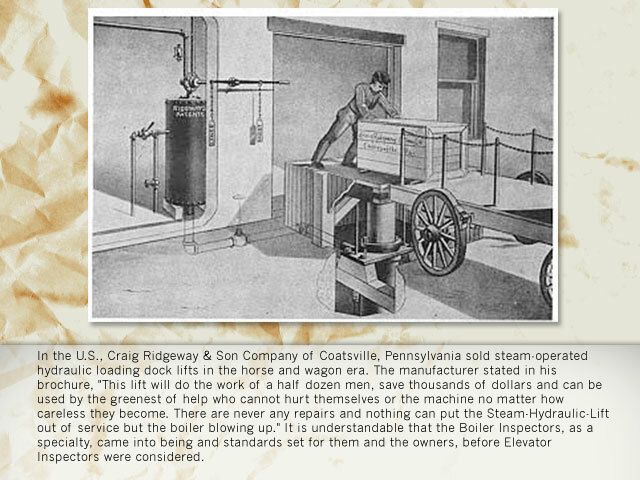 When pumping directly into the cylinder, or later when a system of pressure tanks was employed, 100 psi was common and smaller cylinders, piping and valves possible. Increasing loads and speeds in the multi-story commercial building systems required ever-higher pressures until 200 psi was commonly used. 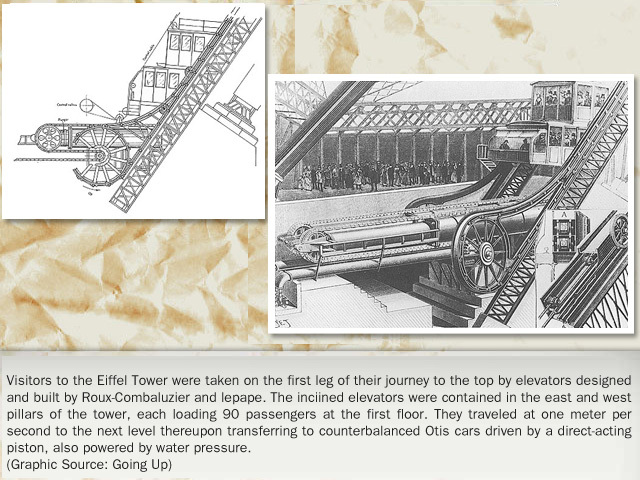 These pressures required heavier equipment so the space occupied by elevator machines was not materially reduced. 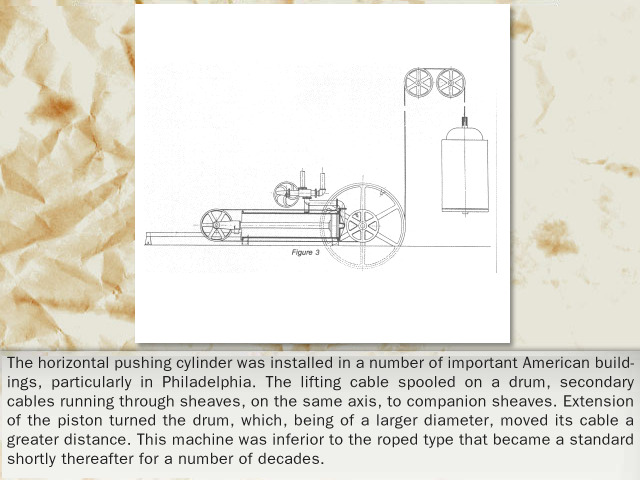 The introduction of pressures up to 1000 psi eventually led to the development of the pull machine.The push machines had both the standing and drive sheaves on the same side of the cylinder whereas with the pull machine all sheaves were on the same side. 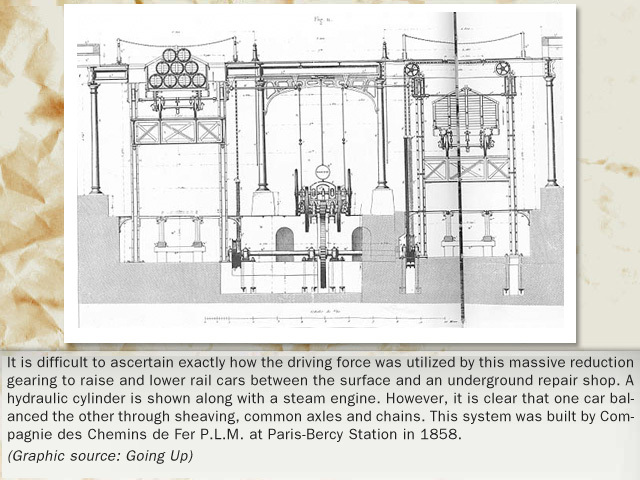 The building were growing ever-taller and one thought was to stand the cylinder on end, alongside the hoistway, where it could be easily extended. 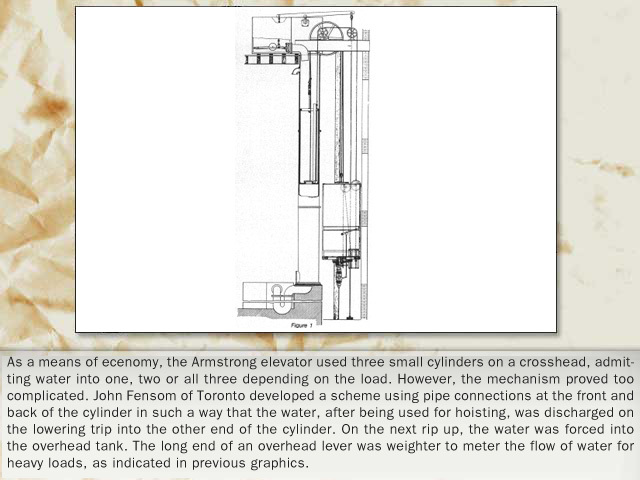 The basements of the higher rise buildings were becoming a conglomeration of cylinders and piping. 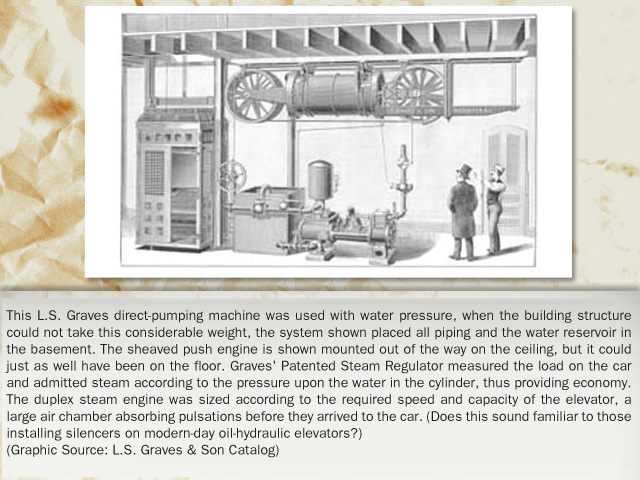 The pushing and pulling water hydraulic machines ruled the industry for a number of decades. 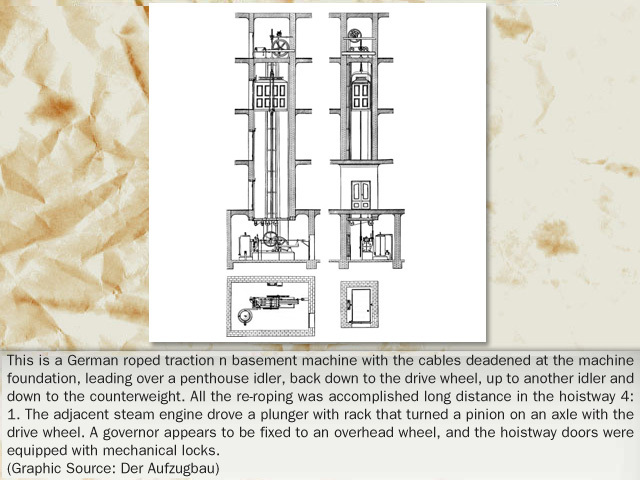 Even when the electric drum machine was refined the greatest contention in the industry's history was between those still favoring the water hydraulic and others eager to welcome the electric powered elevator.